@Mark Doiron So where is the best possible place to mount an antenna? 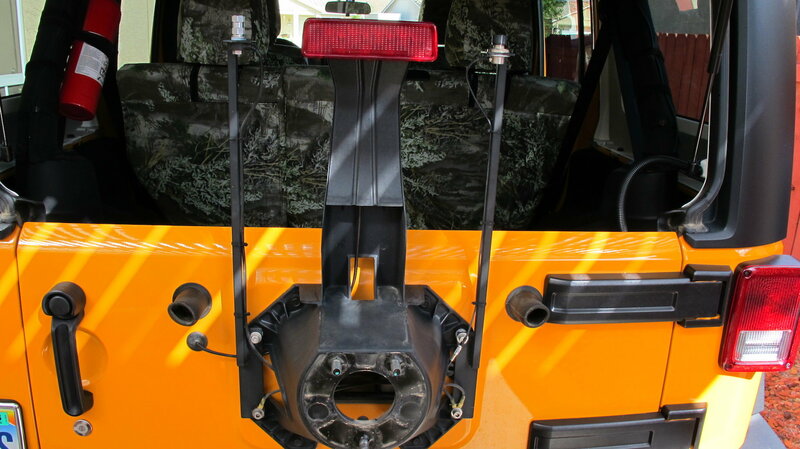 I am getting close to putting in a Cobra 18, spare tire mount definitely seems easiest with Rugged Ridge bracket. I thought about near side view mirror but then, considered that running up against brush or other might be bad for the antenna. I've used 3 setups. First one was with Arizona Rocky Roads mounts, sticking above the stock tire carrier so the antennas are above the spare tire. Ham on one side, CB on the other, and although they should be separated more both worked at the same time. I currently use a front fender mount bolted to the fender for my ham, could be used for a CB, it works well. 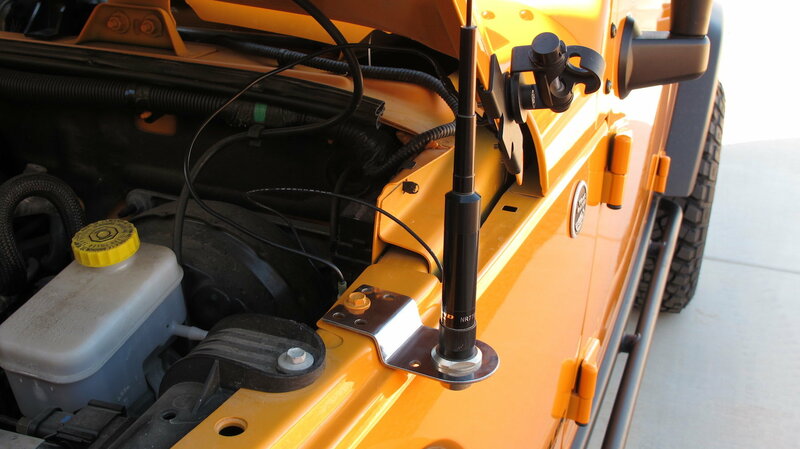 I currently use my aftermarket spare tire carrier mount for both a cb and ham, again raising it above the spare, but I only use either the ham or CB at that location. If I use the ham and the CB, the ham uses the front fender and the CB uses the rear tire carrier. Works fine. By the way, I did run a ground wire from the tire carrier through the tailgate to a stock small screw on the floor next to the rear speaker. The worst SWR is on the aftermarket tire carrier, but it works. 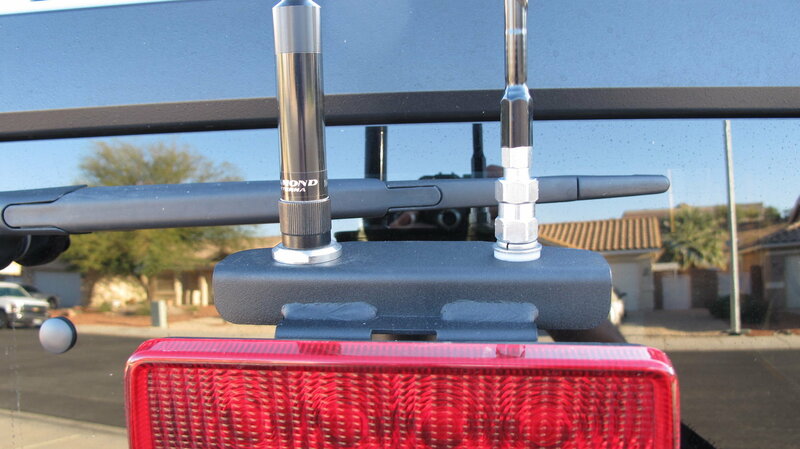 The best SWR I've ever had is with a simple mag mount antenna sitting on the hood! You definitely need sufficient relief for movement. It's worth mentioning, however, that if there is excess cable in the transmission line, don't loop it up and hide it under the carpet. That loop can cause SWR issues. That's one reason I'm not a fan of the pre-cut cable/connector packages. The other reason is that sometimes those packages have very poor grade RF cable--I've seen them with as little as 15-20% shielding coverage. I recommend buy a high grade cable and high grade connectors, include a few extra feet for mistakes and mis-measurement, run it, including strain relief where needed, and then cut off, leaving a couple extra inches at each end for future repairs. Any exterior connections should be sealed up with RTV to prevent water intrusion. Yep. The wonders of having a decent ground plane. "Best" for performance is as previously mentioned: Smack dab in the middle of the hood. You'll have a great ground plane. And the cops perhaps taking an interest in you. So probably not very practical. Especially if you travel through heavy brush. I have friends who've installed on the front bumper (aftermarket steel) with great success. And if you're not worried about brush or the antenna being in the way of your photo shoots (which is why mine isn't there), that's a good place. Pretty easy to wire up, too. I did have my 2m/75cm ham antenna back on a AZ Rocky Roads mount, but it wasn't performing very well. Moved it up to the overhead rack and it does much better. Bear in mind that a ground plane does not need to be a solid sheet of metal. Depending on the wavelength at which the radio is operating, screens, individual elements of metal tubing, etc, can all provide an effective ground plane. My CB I've kept on the tailgate. It's range is limited because of that, but it works for trail use, and roughly a mile or so along the open highways. Primary reason I leave it there is for protection from brush. It still gets banged around some, but I've never had it broken off. Have had to replace because the banging around damaged it internally. I carry a spare, as well as a spare (handheld) radio. @Mark Doiron Last couple of coax questions. Any ideas where to score a connector like this? I’m in the same thought process as you, I’ll buy coax cut to length and terminate the ends. I’ve checked my usual spots Mouser, Newark, and EDMO to no avail. All the dang Radio Shacks are gone now. Found plenty of BNC but that won’t work. Now for your video, holy cow you weren’t kidding about brush! Man that looked like a blast though. Your one buddy was towing a tent trailer was it one of these? All those dead trees guessing that was beetle kill? Have a ton of beetle kill here in Colorado. Funny you ask about the trailer. The guy pulling the trailer and the fellow driving the pick-up took the more open road down to the campsite we were headed to. Trailer puller didn't want to scratch up his rig, and truck driver had driven the route we were on only two weeks prior and didn't want to go through "The Jungle" a second time. And, though that wasn't a Conqueror, after this trip that fellow sold that trailer and bought a Conqueror, which is what he has now. His Jeep, BTW, had a Hemi. In fact, at the time he had two Hemi Jeeps, but now he also drives a pickup. I think he has a Colorado. Last edited by Mark Doiron; 02-15-2019 at 02:35 AM. Should of figured Chinese Ebay would have it duh.. Thanks Mark. I could go on about Conquerors but that’s another topic.